"Mr. Kenen stated that his first client would probably be the Government of Israel and consequently I told him that he should file a new registration statement on Form FA-1. I explained to Mr. Kenen the registration statement of the Israeli Office of Information and the necessity for the filing of a new statement. Mr. Kenen stated that he would file a new statement as soon as he commences his activities on behalf of the Government of Israel. Suitable forms were given to Mr. Kenen." "Israelis began looking for a lobbyist to promote the necessary legislation…would I leave the Israeli delegation for six months to lobby on Capitol Hill? There were other questions. Should I continue my registration as an agent of the Israel government? Was it appropriate for an embassy to lobby? Embassies talked to the State Department, and American voters talked to their congressmen." Kenen left the Israel Office of Information to lobby for the American Zionist Council and later became chairman of the American Israel Public Affairs Committee known as AIPAC. 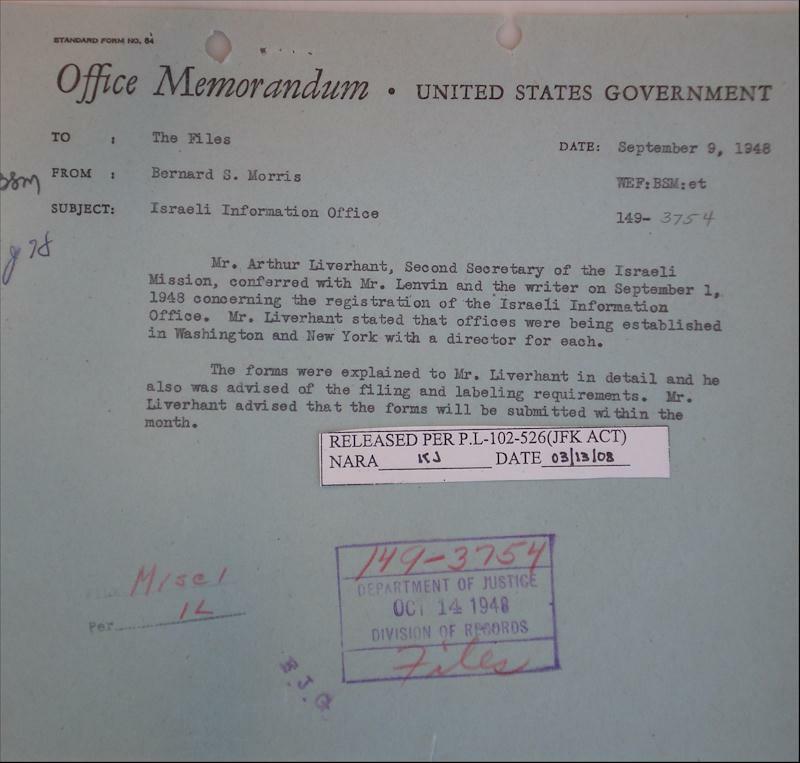 09/09/1948 DOJ memo to files by Bernard S. Morris "Mr. Arthur Liverhant, Second Secretary of the Israeli Mission, conferred with Mr. Lenvin and the writer on September 1, 1948 concerning the registration of the Israeli Information Office. Mr. Liverhant stated that the offices were being established in Washington and New York with a director for each. The forms were explained to Mr. Liverhant in detail and he also was advised of the filing and labeling requirements." 10/16/1948 On October 10, 1948 Arthur C.A. Liverhant of Israel's UN Mission submits a foreign agent registration cover letter for a new "Israel Office of Information" naming Rita Grossman, Bernard Zamichow, Isaiah Kenen, Harvey Rosenhouse and Harry Zinder as officers. 10/16/1948 Foreign Agent Registration Act forms naming Isaiah L. Kenen as "Director of Information" of the New York office. 11/01/1948 The Israel Office of Information chooses June 30 and December 31 as calendar reporting deadlines. 11/1/1948 Isaiah L. Kenen's personal Foreign Agent Registration Act declaration. Though he noted in his biographies working relations with many Israeli officials such as Abba Eban and David Ben-Gurion, in the section requiring all connections with foreign officials Kenen wrote "none." 11/22/1948-03/04/1949 DOJ Deficiency Record: "Exhibit A filed Lillian Guterman indicates there is a Calif[ornia] Office"
06/17/1949 DOJ Deficiency Notice: "An examination of your registration statement, filed on October 12, 1948 reveals certain deficiencies which are noted below. It is suggested that these deficiencies be corrected in filing the next supplemental statement...It is indicated that you have an office in the Los Angeles Consulate." 06/30/1950 Israel Office of Information Supplemental Registration Statement submitted by Isaiah L. Kenen. Though he traveled to Capitol Hill to lobby for US arms and aid to Israel in January of 1950 ( Israel's Defense Line) Kenen does not disclose this lobbying foray on this supplemental declaration. 01/17/1951 FARA Section Memo by Nathan Lenvin on an Isaiah Kenen visit. "Mr. Isaiah L. Kenen, Director of Information for the Government of Israel's Mission to the United Nations and one of the officers of the Israeli Office of Information, visited my office on January 17, 1951 to discuss his possible obligations under the Foreign Agents Registration Act in the event he terminates his present activities and establishes his own public relations business. Mr. Kenen stated that his first client would probably be the Government of Israel and consequently I told him that he should file a new registration statement on Form FA-1. I explained to Mr. Kenen the registration statement of the Israeli Office of Information and the necessity for the filing of a new statement. Mr. Kenen stated that he would file a new statement as soon as he commences his activities on behalf of the Government of Israel. Suitable forms were given to Mr. Kenen." 02/13/1951 Isaiah Kenen announces he is resigning from the Israel Office of Information. "Since January 1st, I was retained by the Government of Israel in an advisory capacity in the field of public relations. However, I have now changed my plans and severed my relations with the Israel government. I would, therefore, request that my name be removed from your lists..."
4/10/1951 Isaiah Kenen submits financial statements to the FARA office and requests that his name be withdrawn from the IOI file. 07/06/1951 Israel Office of Information press release announcing plans to solicit skilled workers. 07/26/1951 James X. Kilbridge asks the FARA office to exempt the IOI Department of Professional and Technical Personnel from FARA registration requirements. DOJ's William Foley agrees. 2/29/1952 The New York Times published a short article titled "I.L. Kenen in Zionist Unit Post" which read: "The appointment of I.L. Kenen, former director of information for the Jewish Agency in Palestine, as the Washington Representative of the American Zionist Council, the public relations arm of Zionist groups in this country, was announced yesterday by Louis Lipsky, chairman of the council. Mr. Kenen, who also has served as director of information of the Israel delegation to the United Nations, recently returned from Israel." Kenen also claims that his employment at the American Zionist Council "expired" before his Israel visit, though he immediately returns to AZC lobbying and presents his term as uninterrupted in his biographies. 04/09/1952 FARA section responds to Isaiah Kenen "You state, however, that during the trip to Israel you did not publish or transmit to the United States any documents or propaganda material. In view of your statement, you were not acting within the United States as an agent of a foreign principal..."
04/21/1952 FBI director receives and forwards copies of Israel Office of Information literature circulating without foreign agents disclosure stamps (a typical disclosure would read: "A copy of this material is filed with the Department of Justice where the required statement under the Foreign Agents Registration Act of the Israel Office of Information as an agent of the Israel Ministry of Foreign Affairs is available for public inspection. Registration does not indicate approval of this material by the United States Government.") The FBI queries Assistant Attorney General Warren Olney III whether the FBI should begin an investigation of the Israel Office of Information. Kenen continued work at the American Zionist Council which was ordered to register as a foreign agent in 1962.